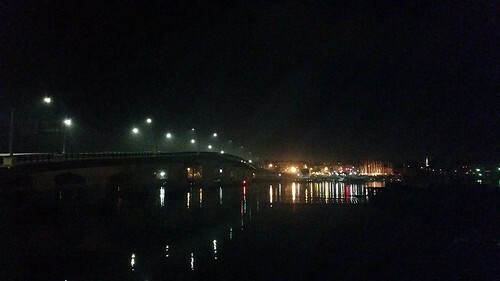 A view of Beverly from the Salem side of the bridge on a foggy night. I recently took a similar picture of Beverly from the Salem side, but with the fog, I couldn't resist taking another. It creates a soft glow around everything and that creates a mood. It's the horror and fantasy reader in me but it speaks of moving into another realm or a coming change. There's also a strangeness experienced when walking in fog--it sounds different and you're conintually trying to put things in focus. It can be equally challenging of course, when you have glasses and need to clean them off. But in this photo, I just like how it adds a subdued sense of the bridge and city.